“Gorontalo Hidden Paradise” – NEW! “Conservation biologists have confirmed that the Earth’s greatest concentration of marine species exists in an oceanic region tagged the ‘Coral Triangle’. From its northern tip in the southern Philippines, the triangle spreads south-east and south-west encompassing eastern Indonesia. Resting squarely in the bullseye of this rich tropical sea is the little-known Indonesian province of Gorontalo. Gorontalo Hidden Paradise is a 166-page pictorial book that is a gallery of rare underwater images illuminating a special corner of the world waiting to be discovered. The vision of native-born governor Fadel Muhammad, the story comes from the pen of resident divemaster Rantje Allen, with masterful images from Asia’s best marine wildlife photographers --- William Tan (co-author of Silent Symphony), Takako Uno and Stephen Wong (authors of An Ocean Odyssey). Facing double-page foldouts present a spectacular no-holds-barred turf war between blue ring octopi. Just a few pages earlier, a delicate cleaner shrimp busily probes for parasites inside the gaping jaws of a golden ribbon eel. Only the experienced eye of a true naturalist would notice juvenile jacks living in a symbiotic relationship with a fast-moving ball of feeding catfish. … Just pages away, the portrait of a mimic octopus slipping over the sand is as good as it gets. Fortunately, no one left their wide-angle lens at home. Coral carpeted pinnacles, walls, caves and crevices highlight Gorontalo’s varied terrain. On a wall at 20m, the team discovered a unique growth of vase sponge so radically grooved that they dubbed the surreal creations the Salvador Dali Sponge. The eccentricity of the sponges is matched in beauty by a rare powder-blue sea fan framed by a deep blue sea. “Three of the world’s top photographers joined forces to produce the year’s most memorable underwater coffee table book. To this I have to say: It’s about time. As an editor, I’ve been privileged to work closely and follow the careers of photographers William Tan, Stephen Wong and Takako Uno. I have always marveled at their incomparable talent of getting the absolute most out of any given photograph. 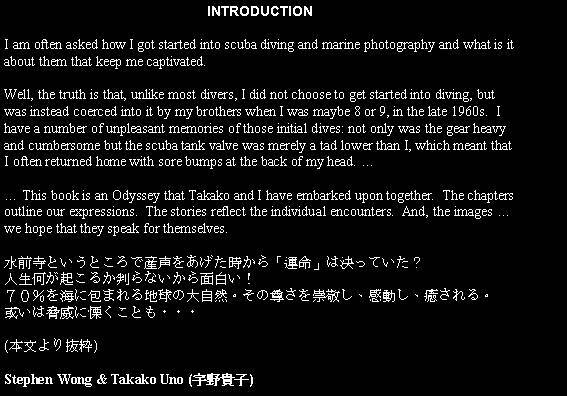 After several remarkable efforts on their own, William Tan (who co-authored Silent Symphony), Stephen Wong and Takako Uno (who recently published An Ocean Odyssey) have teamed up to create a visual tour de force. Gorontalo Hidden Paradise chronicles the hitherto unknown beauty of Gorontalo. Haven’t heard of it? You will. Gorontalo Hidden Paradise is clearly a labor of love. Author Rantje Allen’s reflections and adventures from seven years of uncovering the hidden beauty of North Sulawesi’s Gorontalo province are told in a series of extended captions and traveler’s tales. His narrative shares the story of a small place with big ambitions, with a rich ecosystem both above and below the water that is only now being discovered. But it’s the photography that really tells the story. While most books are the result of a single photographer drawing upon several years and several different destinations, these three artists accomplished a Herculean effort: Limited to the tiny province, and given only one year to finish the project, they have brought Gorontalo to life. Their passion and dedication show in every image. William waited six days for a single shot of a yellow ribbon eel with a cleaner shrimp on its nose … in Gorontalo even the impossible is possible. … Takako’s tender photo of a soft coral pipefish, or Stephen’s glorious two-page shot of hard corals that reveals the startling health of Gorontalo reefscape. “I’ll be honest. Having never been fortunate enough to dive in Asia, I’d never heard of Gorontalo – until recently. … Unlike traditional travel guides that discuss how to get in and get out of a location, Gorontalo Hidden Paradise doesn’t bother with that. After reading the book’s lyrical words and looking at its remarkable images, however, I can assure you that you’ll drop everything to find out how to get in to this beautiful location soon. And by ‘soon’, I mean: now. The book opens with a history of the Gorontalo and a brief description of topside activities. It then launches full-tilt into the good stuff: the good stuff, in this case, being the diving. … (Allen’s) His knowledge and passion sparkle on each page, and the captions he provides for the images in the book are both amusing and informative. … The real star of this show … is the collection of images that shine, pop, glimmer, and burst like carefully packaged fireworks – if fireworks could ever be so gorgeous. … Gorontalo’s main appeal: it’s the marine life that grabs you. Gorontalo Hidden Paradise is loaded with dramatic and unusual images of marine life. From fun-loving bottlenose dolphins, to fearsome Scalloped hammerheads; from puny Popcorn-head shrimp, to Pearl-eyed morays, the underwater world here is thriving. … Showcasing one of the richest ecosystems in the world, Gorontalo Hidden Paradise is a treasure. More than just a coffee table book of astounding beauty, the four-person team that put this book together have introduced to the world – and especially the diving community – a new, special, one-of-a-kind dive site. Filled with marvelous and unique marine specimens – many of which are found nowhere else in the world – Gorontalo might be the diving nirvana that we’ve been looking for all these years. Vibrant fish life. Uncrowded, healthy reefs. Unique topside attractions. What more is there for divers? I’m convinced that Gorontalo is heaven. Gorontalo Hidden Paradise is Hard Cover with 166 pages of extraordinary marine images taken in the newest province, Gorontalo, of Indonesia. Governor Fadel Muhammad of the Province of Gorontalo initiated and endorsed the making of this elegant marine photo book. Gorontalo Hidden Paradise retails at USD50 plus postage & handling. For Orders: please contact saiwong@netvigator.com . For more of Stephen Wong and Takako Uno’s photography and detail Profiles, please visit their websites: www.stephenwong.com & www.takakouno.com . *"Celebrate the Sea", authored by Stephen Wong and Michael Aw, is a 28cm X 28cm 180-page coffee table book. The "Limited Edition Hard Cover", is priced at USD80.- per copy plus postage & handling fees. This "Limited Edition Hard Cover" has individual certificate of authenticity, which means that you should fill out the information sheet enclosed in this edition, and mail in the sheet to obtain the certificate. Each book has an individual number. It is a collector's copy, and only 1500 copies of this "Limited Edition Hard Cover" have been made, and this Limited Edition will not be reprinted. *The Photos in "Celebrate the Sea" have been selected by quite a number of editors, including Mr. Stan Waterman (often referred to 'The Man who loves Shark'), & Mr. Stephen Frink (one of the most published underwater photographers in the world). The introduction (or 'An Appreciation' stated in the book) is written by Mr. David Doubilet (National Geographic staff-in-residence). 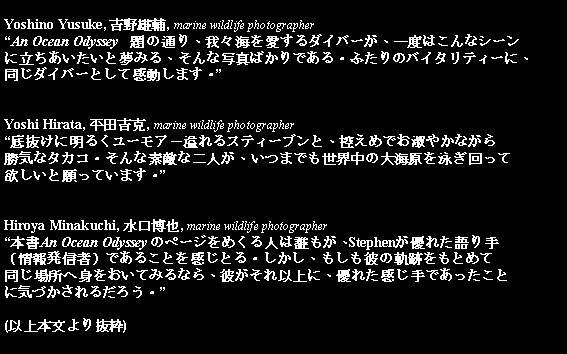 The ending prologue is by Mr. Doug Perrine (another famed underwater photographer who specializes in Sharks & Cetaceans).